Smirnoff Premium Blueberry Flavoured Vodka is made with natural blueberry flavours and a pure-tasting, smooth vodka distilled from a blend of the finest grains, then filtered ten times through seven columns of charcoal in a unique process. 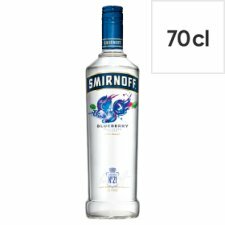 Its fresh and delightful taste will amaze even the most sophisticated party guests: Smirnoff Premium Blueberry Flavoured Vodka is exceptionally smooth, fresh and fragrant. It is ideal to drink over ice, with lemonade or with your favourite mixer. Make more interesting drinks and mix up those famous classic cocktails with Smirnoff Premium Blueberry Flavoured Vodka. Made with vodka which is created by a unique process involving three distillations for purity and ten filtration stages to deliver exceptional smoothness.